Private lessons provide the most individual attention. They’re the best choice if you prefer learning one-on-one! To find out more about our teachers, click on the instrument you’d like to study. Once you’ve found a teacher, contact Dusty Strings at (206) 634-1662 or visit us during store hours. We’ll let the teacher know that you’re interested and they’ll contact you within a few days to schedule your first lesson. Group lessons may also be arranged. Please contact Jonathan Shue, Director. Each teacher establishes their own rate based on their experience and depth of knowledge. Most lessons range from $35 for 30 minutes to $70 for 60 minutes. All lessons take place at Dusty Strings, 3406 Fremont Avenue N, Seattle, WA 98103. From I-5, take the NE 45th Street exit and drive west. Turn left on Stone Way N, drive to N 34th Street, and turn right. Dusty Strings is on the corner of N 34th Street and Fremont Avenue N. There’s both paid and free two-hour parking in the neighborhood. Bus routes 26, 28, 31, 32, and 40 drop off right in front of Dusty Strings. All private lessons are pay-as-you-go. You can pay with cash, check, Visa or MasterCard. Payment is due on the day of the lesson before the lesson takes place. If you need to cancel, you must give 24 hours notice to avoid being charged for the lesson. For private lessons, you should bring your instrument, a notebook, and a pencil. Your teacher will let you know if there are other items that will be useful to have. These might include an electronic tuner, picks, staff or TAB paper, a capo, music stand, foot stool, recording device, or other item. All accessories are available for purchase in our retail store during store hours, Monday – Saturday, 10:00 AM – 6:00 PM and Sunday 12:00 PM – 5:00 PM. You can schedule lessons as often as you like (based on the teacher’s availability). Most students take lessons weekly or bi-weekly. Lessons are 30, 45, or 60 minutes long. We want you to have the best learning experience possible. If for any reason you wish to change teachers, please let us know so that we can refer you to another teacher. 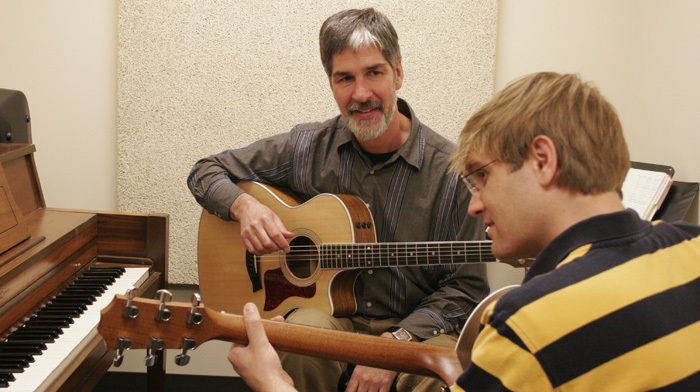 Is there a class, instrument, or something else that you’d like to see taught at Dusty Strings Music School? Let us know! Email music@dustystrings.com with the subject, Attn: Jonathan.